The main benefit of hex dumbbells is that they don’t roll. If your floor is even slightly uneven (as many floors are), rolling can be a big annoyance. Rolling can also be a hazard, especially when heavy dumbbells roll over your feet. The fact that hex dumbbells won’t roll is important if you want to do certain floor exercises, such as dumbbell pushup rows. You can’t do these exercises with round dumbbells. Another difference between hex and round dumbbells is that you won’t get as many pro options. For example, most hex dumbbells only are available with contoured handles. Also, many hex dumbbells aren’t rubberized. If you are going to buy hex dumbbells, it is really worth it to look for rubberized ones as these won’t damage your floor or have their paint chip off. Round dumbbells usually are rubberized, which is a big plus if you don’t want to worry about the paint chipping off your dumbbells. 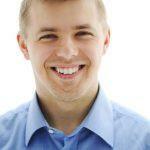 Rubberized dumbbells are also safer to drop on the floor. You’ll also find more handle options with the round dumbbells, such as straight handles as well as the contoured handles. 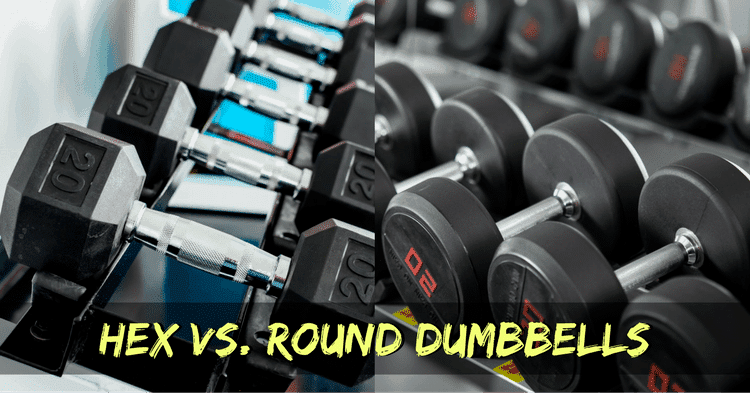 Note that the term “round dumbbells” is often used interchangeably with the “Pro-style dumbbell.” While all Pro-style dumbbells are round, they are NOT the same thing! Pro style dumbbells are made using a chrome handle with various plates on them. They are different than adjustable dumbbells (which can be hex or round) in that Pro-style dumbbells are fixed weight. They have a heavy-duty bolt and end cap on them to keep the plates in place. The handles of pro-style dumbbells are also only long enough for a specific number of plates. If buying unassembled pro-style dumbbells, you will have to make sure the handle length matches the amount of plates you need. However, since most pro-style dumbbells are now sold pre-assembled, this isn’t something you typically have to worry about. For most people, hex dumbbells are probably the best choice because they are affordable, won’t roll, and are more versatile. However, it can be a bit harder to find rubberized hex dumbbells – and this is a feature which is really worth paying a bit extra for. If you aren’t worried about rolling, then round rubber dumbbells are fine. Otherwise, check out these best rubber hex dumbbells.